Unfulfilled at her job and unsuccessful in the dating department, Janice MacLeod doodled this question at her desk. Then she decided to make it a challenge. Over the next few months, with a little math and a lot of determination, she saved up enough to buy two years of freedom in Europe. But she had only been in Paris for a few days when she met a handsome butcher (with a striking resemblance to Daniel Craig)—and never went home again. A love story in the vein of Almost French and Lunch in Paris, Paris Letters is a joyful romp through the City of Light, and an inspiring look at what can happen when we dare to create the life we want. Realizing that her Parisian love affair would be forever, MacLeod began her own business on Etsy, creating beautifully-illustrated letters from Paris inspired by artists like Percy Kelly and Beatrix Potter. She now paints and writes full-time, bringing beautiful things to subscribers around the world and reviving the lost art of letter-writing. 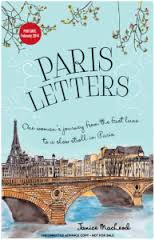 Books like Paris Letters make me vow to read more non-fiction. I loved this memoir! I never wanted it to end...I enjoyed every page of Janice's journey. The book starts with Janice, a copywriter for an advertising agency in California, unhappy with the rigidity of daily life. She is an artist at heart, yet her creative spirit is suffocated by her mind-numbing work and the constant demands to produce more work for less money in less time. She dreams of leaving her job and traveling, yet doesn't know how to make her dream a reality. Janice decides that she needs to save $100 a day for a year, in order to have a year off of work and decide what she wants to do for a new career. I loved her determination to meet her goal: she immediately starts making lists of ways to save money (as a fellow list-maker, I appreciated this aspect of her personality). Janice starts by cleaning out her closets, getting rid of clothes she doesn't wear and things she doesn't use around her house. She keeps the momentum up by not shopping, going out to eat, or spending money for leisure activities. Janice sells unwanted possessions on eBay to make money, and decides to start selling some of her paintings on Etsy as well. Finally, Janice has the money to start traveling. I was really excited for her travels around the world, and her journey to a different life to start! The imagery in this book was so well-done. I felt as though I was there with Janice as she traveled around Europe. I loved reading about her daily life overseas: even little things like her morning coffee were exotic and interesting. Paris Letters was a story of great personal growth and self-reflection. I loved that Janice examines each aspect of her life and decides which parts of her life are beneficial and which parts of her life require change. As she pares down her necessities to one suitcase, so she whittles down her life-long belief systems of what success and happiness are. Janice finds a different life, and a new way to find happiness. That was my favorite thing about this book: Janice changes her expectations, and constantly challenges herself to try new things and do things differently, and in the end she finds an unexpected route to bliss. I would be remiss if I didn't mention the love story. The love story was so unique and completely romantic! I never expected Janice to find love in the way she did, and I loved watching her relationship develop. The resolution to the story (which I think must be the hardest part about writing a memoir---how do we know when our own stories "end"?) was perfect. Janice creates her own career, a unique one that honors her creative and artistic nature. It was perfectly suited to her personality and strengths. I loved Paris Letters. It was a great escape for me, and I would recommend it to anyone, especially women who are wanting to change their lives. 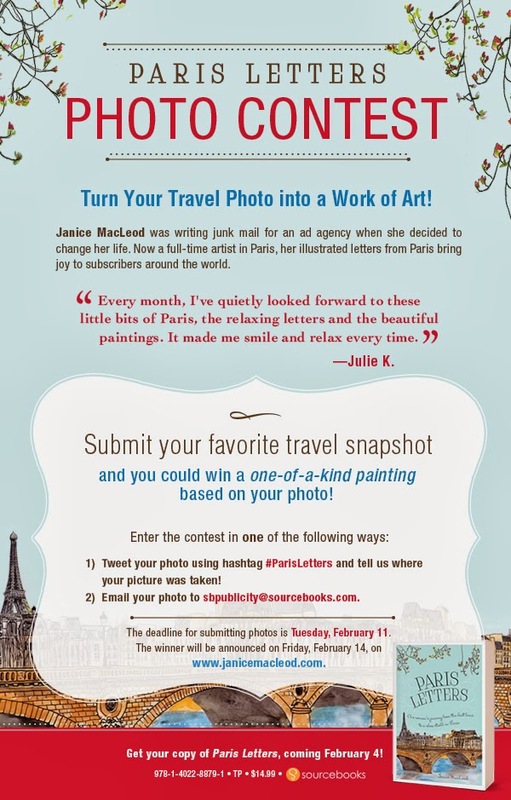 Moving to Paris is not a possibility for me personally, yet I still found Paris Letters to be inspirational and it galvanized me to change a few things in my own life.